Mobile marketing is the most popular advertising tool within the mobile food industry. Some operators have already mastered this form of marketing for their food truck or cart, while others may not even know it exists. The purpose for this article is two-fold. 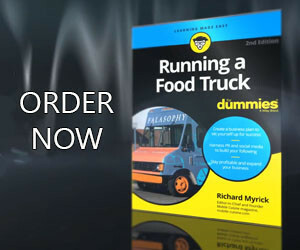 First, it is intended to introduce those not familiar with the techniques and technology of mobile marketing so that they may help themselves spread the word about their food truck brand. Secondly, it will assist those already using these techniques, with some advice to modify their existing methods. These will aid them in maximizing their marketing potential, as well as the possibility of introducing them to some of the upcoming trends and tools. Today we cover the basics about mobile marketing, and provide some data we were able to piece together to show how important learning to master this technology can for your mobile business. Mobile Marketing involves communicating with your consumers with the use of a cellular or mobile device, to send a simple marketing message such as your trucks current location, to introduce them to a new participation based campaign or even to allow them to visit your website. Mobile connectivity not only enables people to connect to the Internet via a cellular telephone, PDA or other electronic gadget, but also consolidates the different communication channels in a simple, yet effective, medium. Much cheaper than traditional means for both the consumer and the owner of a mobile eatery and is easy enough for almost any age group to understand and engage with. Mobile marketing is merely a streamlined version of traditional eMarketing. Even in the US, SMS technology was not widely used until only a few years ago – but in June 2008, CellSigns reported that over 75 billion SMS were sent each month (contrast against only 18 billion just 18 months before). Like it or not, these figures are generally believed to have gone viral in the United States at the same time the television program American Idol began using a SMS voting system. Experian, a marketing services provider in the US, estimates that the number of SMS users (approximately 1.8 billion at present) is twice that of active email users. These text messages are generally read within 15 minutes and responded to within the hour, compared to email communication which could go unread for days. 80% of the US population are mobile technology users. In 2006, there were 241 million mobile users in the US alone (and 332,156 million people in North America). 98% of all cellular phones in the US have SMS capabilities. 68.7 million US citizens use SMS and text services. Although a relatively new service to the US, over 300 billion SMS messages were sent in 2007 in the US alone. Only 10% of SMS messages are spam (compared to over 65% of email). The average American text message user in late 2010 sent 357 SMS messages per month and made or received 204 calls, compared to early 2009 where the average user sent 198 texts and made or received 198 calls. Known as Baby Boomers, the generation born between the 1940s and 1960s, predominantly in the US and UK, form today’s older online market. Born between the 1960s and 1980s, Generation X are more connected than their senior counterparts. They are tech-savvy, but remember a life before the Web, unlike the younger Generation Y, today’s teens and 20-somethings, who have generally known the online world from an early age. As you can probably imagine, the younger generation are able to recall a lot more Mobile Marketing content than Generation X and the Baby Boomers. The younger users are more accepting of mobile marketing due to their increased connectivity and a general interest in market related news.